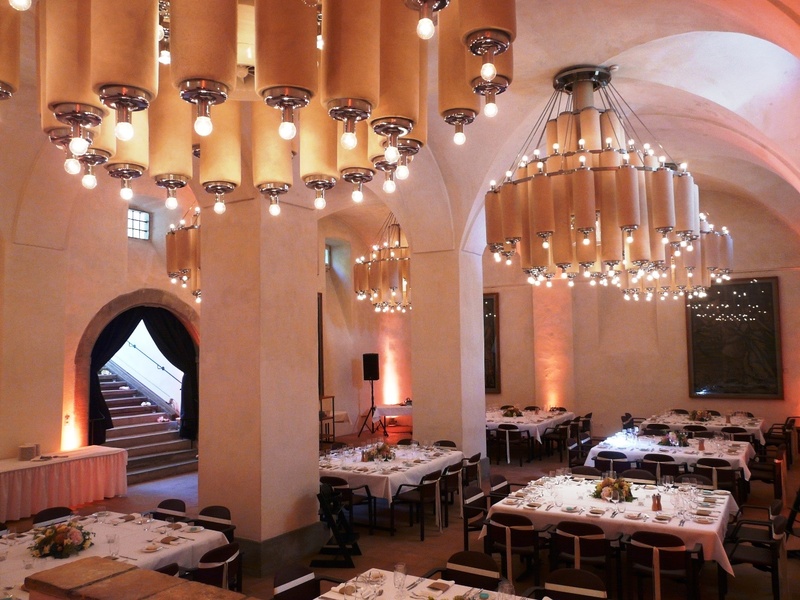 An event location can hardly be situated more idyllically than the Kartause Ittingen. Between the vineyards and hop fields the former Carthusian monastery is located in an absolutely beautiful landscape. The bordering Ittinger forest makes the natural ensemble perfect. Where once monks lived and worked, you find today a splendid flower-garden with the biggest choice of historical rose breeds in Switzerland. Since self-supply is the principle of the Kartause, different fruit and vegetable sorts are grown, an herb garden is cultivated and animals are kept. The Ittinger Museum as well as the Art Museum of Thurgau belong to the Kartause. Moreover, there is the tecum on site - a center for spirituality. Benefit from such a varied offer, when you plan and carry out your individual event. Whether concerts in unique acoustics, banquets, gala dinners and aperitifs or receptions - thanks to more than 30 differently sized event rooms furnished in modern style as well as wonderful open-air areas, there is exactly the right location available for every taste. 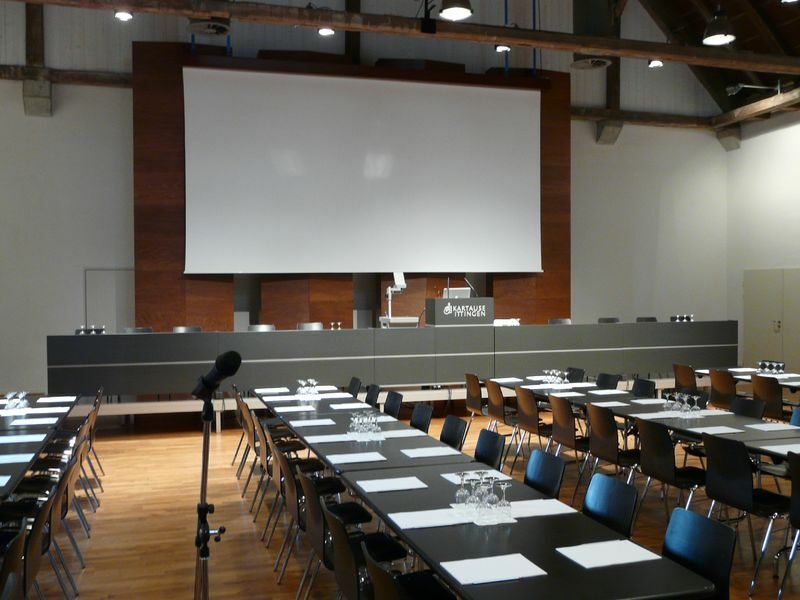 Already since 1983 the Kartause Ittingen, as a conference center, offers versatile possibilities for the realization of your business events. Due to the restful and the inspiring atmosphere, numerous successful events were carried out here. On the whole area, you can use our WLAN. Moreover, we gladly provide technical equipment like digital projectors, overhead projectors as well as a microphone system. If required, screens and bulletin boards, flip charts and facilitator's toolboxes will be offered. At the upper guest house, you may expect nine rooms which support you with optimal conditions for seminars, conferences or congresses. The upper assembly hall with its bright and friendly setting on 136 sqm is the biggest hall (max. 120 people). With 84 sqm and 66 sqm, both course rooms are noticeably smaller and offer a place for smaller groups (30 to 60 people). Course room no. 1 distinguishes itself by its ceiling-high windows which allow a lot of daylight to fall in and a view on the countryside. Course room no. 4 is located in the attic and is kept cool in summer due to own spring water. Our group rooms no. 1 to 6 are also suited for smaller parties (8 to 40 people). With view on the court, the lower guest house welcomes you in a foyer which is suited particularly well for aperitifs or receptions. Here eleven different rooms can be used. It is again the assembly hall which is the biggest (117 sqm). Both course rooms offer space for new ideas on 50 sqm each (max. 50 people), while the ridge stage measures 56 sqm. Seven group rooms of 19 to 38 sqm are suited for smaller parties (8 - 20 people). Our Remise presents itself as a hall of multifunctional possibilities; on 367 sqm all events can be carried out from congresses to in-house company concerts. For small company celebrations, our comfortable 43 sqm big restaurant can be used. For events of that certain something we present the apple garden (max. 100 people) under the open sky. 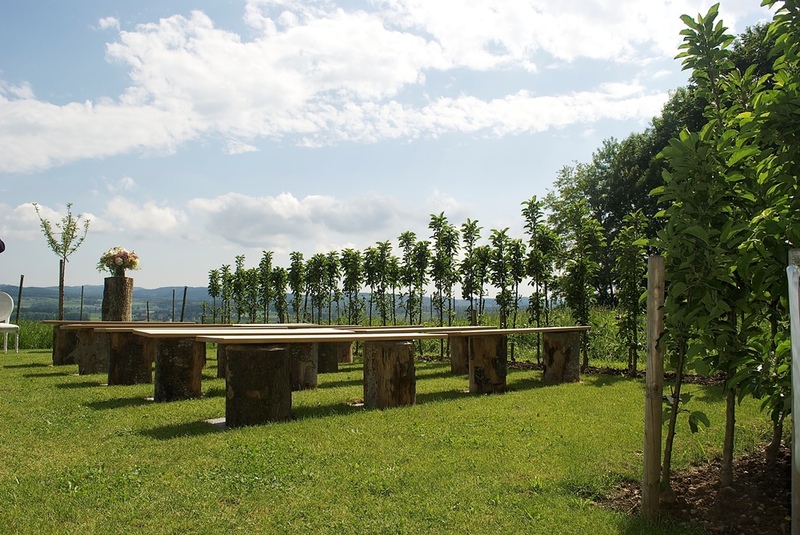 Here you may carry out parts of your conference or seminar and enjoy the positive influence of fresh air! Of course, your business stay in our house should not just be work, so we have put together a colorful supporting program of the most different incentive possibilities. Common experiences and memories unite and make a team out of your staff. Finally, your company will benefit. Do not hesitate, but organize a tasty fondue at the edge of the forest or let three to twelve people discover the arrangement in all its beauty in the course of an amusing scavenger hunt. We also offer informative viewings of the surroundings or guide you through our gardens, the forest or the museums. If you want to lend a hand yourselves, you can make your own cheese with our master cheesemakers and take home your own loaf of cheese. Or you carry out a wine degustation and compare the taste of the noble drops. We produce an unbeatable 40,000 liters per year (together with the noble brandies). The Kartause Ittingen is predestinated as an unforgettable setting for the happiest day in your life. No matter if you carry out your wedding at the 164 sqm big Kornschütte flooded with light (100 to 180 people), at the cellar house with a 158 sqm big banquet hall (150 - 200 people) or at the Remise for the quite big celebration (350 - 400 people) - at ours, you will surely appreciate this venue. For smaller parties we offer our 43 sqm big restaurant as well as the 30 sqm big Carnotzet; the Pfisterei is another special option on 124 sqm. Here the borders get blurred between inside area and undeveloped outskirt area due to the entire opening of the high windows which make you feel like being in a summer cottage. If you prefer a celebration under the open sky, you are exactly right in our baroque garden or in the apple garden. Surrounded by colored flowers and bright red fruits your wedding becomes the unforgettable event not just for you. At the Täferzimmer we offer the opportunity to carry out a civil wedding and in our 68 elegant hotel rooms you and the guests will finally end the big day. Besides from a personal present of the house to the bride and groom, the overnight stay is also free for them! In addition to a unique photo setting and the service offer you get on site we also decorate all rooms and event locations according to your taste. Moreover, the farm estate belonging to the Kartause will conjure and serve a culinary masterpiece to you. According to our principle we serve incomparable dishes with seasonal ingredients mainly from own production. Whether from the agriculture, cheese dairy, butcher's shop, bakery, market garden or the fish farming - at ours you always know what ends up on your plate! There are noble drops from the press house and the distillery of the house to be served together with the dishes. We are looking forward to welcoming you and your guests soon and we also guarantee free parking bays at your arrival.